A millionaire businessman who sold fake bomb detectors to countries including Iraq and Georgia, knowing they did not work, has been convicted of fraud. James McCormick, 56, of Langport, Somerset, is said to have made £50m from sales and sold more than 6,000 in Iraq, the Old Bailey heard. Police said the devices, modelled on a novelty golf ball finder, are still in use at some checkpoints. One Iraqi bomb victim described him to the BBC as a "morally bankrupt" man. During Tuesday's hearing at the Old Bailey in London, the court was told McCormick's detectors, which cost up to $40,000 (£27,000) each, were completely ineffectual and lacked any grounding in science. 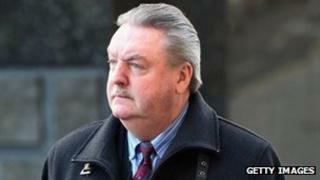 Richard Whittam QC, for the prosecution, said: "The devices did not work and he knew they did not work." McCormick had claimed the devices could bypass "all forms of concealment", detecting drugs and people along with explosives, the court heard. He claimed they would work under water and from the air, and would track an object up to 1km (3280ft) below the ground. The bomb detectors came with cards which were "programmed" to detect a wide array of substances, from ivory to $100 banknotes. Other substances could be detected, it was claimed, if put in a jar with a sticker which would absorb its "vapours" and was then stuck on a card that would be read by the machine. In reality, McCormick's device was based on $20 (£13) golf ball finders which he had purchased from the US and which had no working electronics. Police said McCormick showed a complete disregard for the safety of those who used and relied upon the device for their own security and protection. The court heard there was no evidence that McCormick had tried to sell the products to the Ministry of Defence. BBC Two's Newsnight programme conducted an investigation into the devices sold by McCormick's company, resulting in a UK government ban on their sale in Iraq and Afghanistan in January 2010. It found that senior Iraqi officials knew the devices did not work and it alleged some had received bribes to ensure they were purchased. Iraq spent more than $40m (£26.2m) on 6,000 devices between 2008 and 2010, the programme said. General Jihad al-Jabiri, the head of the Baghdad bomb squad, is currently serving a jail term for corruption, along with two other Iraqi officials. One senior Iraqi official told the BBC that the useless devices had created a false sense of security - and that no punishment would make up for the blood that had been shed as a result. BBC Newsnight also spoke to Haneen Alwan, an Iraqi woman who needed 59 operations after she was injured in a bomb blast in January 2009. She was two months pregnant at the time and lost her child. She told the programme: "When people passed through checkpoints using these devices, they thought they would be safe, but they are useless. The man who sold them has no conscience. He is morally bankrupt. How could he sell them just for money and destroy other people's lives?" Meanwhile, Avon and Somerset Constabulary's Det Insp Ed Heath told the BBC the devices had been used at numerous checkpoints in Iraq. He said: "It is clear that both civilians and armed forces personnel were put at significant risk in relying upon this equipment. "McCormick showed a complete disregard for the safety of those that used and relied upon the device for their own security and protection. He amassed many millions of pounds through his greed and criminal enterprise." The force's Det Supt Nigel Rock described McCormick as a "conman", adding: "We have heard evidence from many, many experts, scientists, leaders in their field, who have said this was a fraud. A sham. "That device has been used and is still being used on checkpoints. People using that device believe it works. It does not." McCormick was remanded on conditional bail to be sentenced on 2 May. Watch Newsnight's full report on the fake bomb detector story and the programme's investigation into it at 22:30 BST on BBC Two on Tuesday 23 April 2013.